Here’s a recent address for the Lusaka Mission. We try to keep this information up to date, but it’s a good idea to check the address with several sources, including your mission packet or the mission office. Here are in-depth YouTube video interviews with returned missionaries from the Zambia Lusaka Mission. We interview hundreds of returned missionaries each year, so check back regularly to see new RM interviews. Here are LDS-friendly educational videos about Zambia. We scoured YouTube to find the best quality videos about Zambia, that are free from inappropriate music, immodesty and profanity. Here’s a list of LDS missionary blogs for the Zambia Lusaka Mission. This list includes the missionary’s name, URL and when their blog was updated. 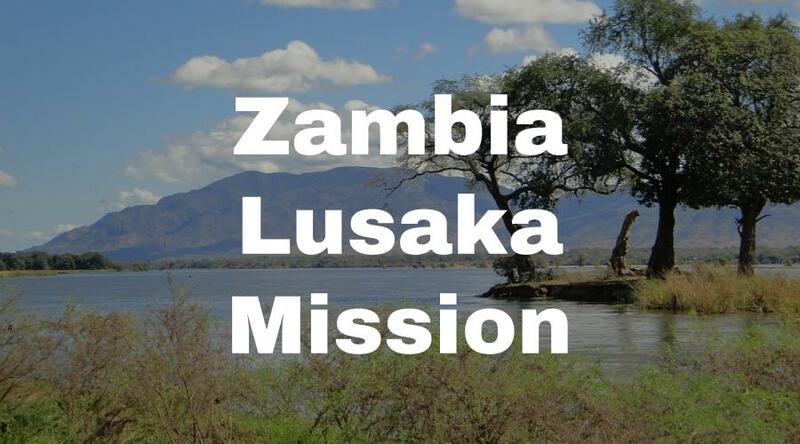 Here are Zambia Lusaka Mission Groups- for LDS missionary moms, returned missionaries, mission presidents and other alumni of the Lusaka Mission. Here are T-shirts for the Zambia Lusaka Mission! Shirt designs include Lusaka Mission logo/emblem shirts and Called to Serve shirts. The shirts make great gifts for pre-missionaries, returned missionaries and missionaries currently serving. LDS Mission shirts come in all sizes: Small, Medium, Large, Extra Large, up to 4XL. The mission designs are printed on white shirts and are shipped to you. *Simply click on a shirt design to view the details and submit an order. 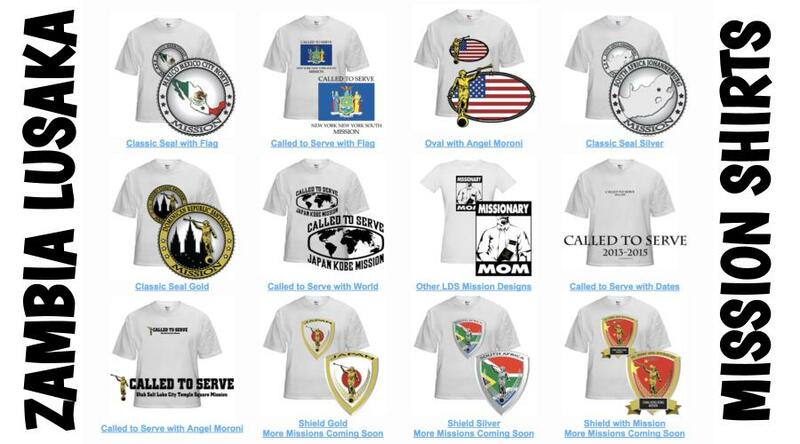 The designs on mission t-shirts may also be printed on other LDS mission gifts, including: Lusaka missionary aprons, Christmas stockings, ties, pillow cases, teddy bears and Christmas ornaments. Here’s a list of current and past Mission Presidents of the Lusaka Mission. Here are survey responses from Lusaka RMs, to give you a snapshot into what it’s like to live in the mission. What are some interesting facts about the Lusaka Mission? Any advice/testimony for pre-missionaries called to Lusaka? Zambia Lusaka Mission had two countries then. Now it’s Zambia and I spent 7 months there and Malawi… spent 17 months there. Zambia is a lot bigger country and has about 72 languages in it. Malawi has 12 different languages is a much smaller country and has about 14 million people there. For the size, 12 languages is quite a lot for the size of the country. The church and the mission I believe had been there, I want say, back in the 1950’s originally but when they started having their independence…their struggles for independence there were wars but they did not really fight wars. The Church was there but mostly worked with the white settlers there. When the people took their independence, they pushed the white settlers out. The church kind of left as well. There weren’t many members that were African at the time. Some of the church buildings were taken over by the African’s at this time and they were used as schools. They look like chapels but are no longer used for that and they are part of the school and the classrooms. No longer used as a church building. The same with Malawi. It is pretty similar where it had the church. I guess that the first place that had the church was a group in Luwanda. It was actually a branch and they became a group who were having some doctrinal issues that were going on there and apostasy had happened but the church had spread out to Blantyre and Luwanda where there still the church there. When I was there, but it has probably spread from there. In Zambia, the missionaries were found in Lusaka, the capital of Zambia. At the top of the belt, there were two different little towns that were there and you could find missionaries. I took about a three hour drive to get there. I wouldn’t be surprised if there are missionaries and that Luanda has grown as well. I know they were working a lot just building the church there. It was really small areas. There were no wards or stakes in either of the countries. When I left, there were about 36 missionaries between both countries. We were supposed to have a lot more come. There were not very many buildings. There were meeting houses or places they would meet in. There was one chapel in Malawi and one in Blantyre. There were quite a few in Lusaka. There were no chapels, at least until now, in the copper belt area. They just all meet in houses and whatever they could find that would do. I think it has been about 17 years that the church has been proactive. So the church is growing roots and very basic foundation of it. I guess that was a lot of what we would try to do while I was there…try to build the foundation. There were a lot of members who would bring stuff from their background so there was a lot of teaching stuff about how the church works and functions and trying to bring the Church’s teachings and doctrines in as well as the regular operational stuff. The Young Men’s and Young Women’s weren’t fully operational. The people weren’t entirely sure how to do this or how you do that and Presidents getting used to the handbook’s instructions. It was very interesting. We were doing a lot of keeping our eye out and reporting to the President so that things could be kept on the right track and that false doctrine wasn’t taught. You really get to appreciate what we have here even in the church with how well it’s been founded and how it has really grown and functions. We don’t realize what goes into that and how much the people need to learn and act on to be able to make something run like the church organization here. I guess it was a little different going to Joburg MTC. You have the chance to go straight from there to South Africa. So you get out and your first thought is that it is going to be way different than here but South Africa looks very much like America and seemed very familiar and then you finally come up to the MTC and you see that it’s this big wall with all these spikes and stuff around it. It was a great experience. It was an extremely spiritual experience. I guess the thing I liked especially was that it was a very small MTC. There was only about 28 people there when I was there the entire time. We spent three weeks there and we learned the languages there. We learned a lot but we learned about spiritual things more than anything. You get to meet a lot of new people and start getting used to different cultures. You find that every country that is around there…every missionary that comes there has a completely different culture and background. That was real interesting when we were there. After three weeks…it felt like it was longer…we finally got to go out into the mission field. The MTC wasn’t as different as I was expecting. As you more effort into it, the Spirit becomes stronger. You learn a lot about the gospel and about yourself there. The people in Malawi are very Christian. They have basic beliefs in Christ. They know the Bible really well. I remember the first time they started throwing Bible verses out, I thought oh my goodness, I don’t even know what you are talking about. That was one thing I learned that it was very important to study the Bible and the standard works…not just the Book of Mormon and things and incorporate that with the Bible as well. Because they knew the Bible for the most part, you were able to build on that knowledge that they had. They quickly gained a knowledge from the Bible and if you don’t know it, a lot times they think you are not Christian. One thing we learned as well is that many of the pastors and ministers did not like us because many people joined the Church. When I first got there, we would teach 20 or 30 lessons a week. They were long lessons but we did not have problems getting in people’s doors most days. The hardest part was figuring out who was the most prepared to receive it, who you needed to focus on and who is not so you can encourage somebody else at the time. You find that a lot of pastors and ministers there preach a lot about us. Many of them think that we are kind of Satanic and demons and stuff out there. I remember walking in Zambia and they started yelling horrible things like you are going to burn up and stuff which was always funny. We would start walking towards them and start shaking their hand and they would scatter and run. Most churches there are kind of like non-denominational. There are a bunch of churches that are randomly started by a bunch of random people. A lot believed in prophets and we met a lot of self-proclaimed prophets and had some pretty interesting conversations with them. We also found some TV prophets that would do like these miracles on TV that would be all the way out there. TV Joshua and Pastor Chris things like that. They were guys who did TV shows and TV miracles. Africans are very faithful people and believe just about anything anyone tells them so it was very important, as we were teaching them, to express that they could find out through prayer what is true and not just to believe you like they believe what goes around there. The Pentacosts are a big thing if you want hear a lot of singing and dance kind of stuff, that is pretty much where you will find it. I didn’t experience a lot of singing and dance outside of the church aspect while I was there. Maybe one or two guys pleasantly singing beside the road but you can definitely find the choruses and choirs from all the churches. You hear that all the time. Walking around you always hear people with keyboards and singing. Everything is Christian based. You won’t find anything that is extremely sexual or anything like that. It is all centered on the Lord and things like that so that is one great thing that they have going for them which is why the people accept the gospel so quickly and so easily. For transportation people would take these things called convis. A few people have cars. Near the city there are a lot of gated communities. Every house has a gate or a wall actually, even the missionary apartments. Most of the people build their houses out of mud bricks. Most families will live in a house for generations or when a child gets married they might build their own house close by. Most people have a garden and they will sell the produce to make some extra money. Pretty much everyone farms in some way or another. Pastors are pretty common jobs as well. There are churches on every corner. A lot of people don’t have steady jobs and will just take work where they can find it. There are a lot of policemen there and we knew a couple that were members of the church. Cops there can be very corrupt, so it’s good to know some. A couple people were construction workers. For the most part it’s very agricultural though. Some people hire guards for their homes. We had guards too and they were always great to teach and talk to. They work at least six days out of the week. there. Those without jobs are relatively easy to find and teach. They just kind of live off of whatever they can grow and whatever work they can find. A lot of western culture is working it’s way in, but in the villages it can be very different and you have to be careful and show respect to the people, especially the elders. When you give someone something, they kind of clap their hands together before taking it to show gratitude. Try to learn greetings in their own languages in the villages you go to. Although they know English, they prefer you to speak in their native language as much as you can. It’s impolite to reject food. They’re very understanding if you tell them you’re full though. They understand that. If you just reject food they don’t like they and they will offer you food even if they don’t have much. A lot of times we were told not to eat the food in certain villages and we just had to tell them we were full. A lot of times the chief of the village likes to meet you when you come in. A lot of the times, we had to meet with a lot of the pastors of the different areas. They wanted to know what you’re teaching and they don’t always like you after a while. Eat with your hands. You don’t have to worry about table manners or anything like that. They like knowing that you care. Expect them to hold your hand. That was really weird at first. A guy will come up and just hold your hand and that’s a sign of friendship. Past that, it’s simple and you’ll adapt to the way of life. Show them respect and be kind and you’ll be accepted. There’s a dry season and a wet season. It’s hot pretty much all year round. I remember it was really dry and hot when I first arrived and they said it was supposed to be raining. That first rain storm just drenched us and sometimes the roads become like rivers. We were up to our knees in water on the main road. When the rainy season starts, it rains pretty much every day. It’s just totally mud. Expect to walk with wet feet for a while. I know a lot of the African missionaries don’t like walking in the rain, but we did a lot of it. Me and a companion actually got hit by lightning one day and it didn’t hurt us at all, but it just felt really weird. The rain makes everything really green and really beautiful. For the most part it was really safe. I think the sisters had more problems than us because the guys wanted to marry them. The biggest issue is the amount of drinking. I think like 90% or something crazy like that is the amount of people that drink. We were in a few situations that could have gone really bad, but people will protect you and they respect the missionaries and see them as holy. There were a couple of robbery issues. Follow different routes home each night. In Malawi there is a bridge that run into people on. I’m bigger than most people there so it wasn’t much of a problem. Right as I was leaving, there were some issues. There was a sister that was robbed at the gate to her door. She gave up her packages that she had just gotten in the mail. We never had any missionaries that were hurt though at all. There was one elder that had his backpack cut off of him. I’ve heard a lot of things about South Africa being a lot worse. Don’t touch the snakes. They have lots of deadly snakes out there you’ll run into. I kept a machete with me because of that. Monkeys are a problem occasionally. They saw a little baboon and ended up having problems when all the rest of the baboons started chasing them and they had to escape onto these rocks. In some places there are a lot of hippos and crocodiles, so you shouldn’t go up too close to the water. Elephants are really dangerous as well. We never got hurt, but they scared us. Most of the areas where the missionaries live don’t have too many dangerous animals. The people think everything is poisonous, so you can’t really trust them on that. They would tell us that the chameleons were poisonous. We saw a couple pythons too. We had one missionary run into a king cobra once. They have the black and green mambas that can kill you quickly. The kids in the village usually find those before you do though because they’ll go throw rocks at them and stuff. If you don’t know what it is. Act like they’re all poisonous. It might be a good thing to look up before you go. Out of the 33 elders that were there, only 3 of us were called to the Zambia Lusaka mission. We were trained well in the MTC, but we really had no idea what to expect. It had just rained when we landed in Zambia. The rain there is huge. It’s really hot and it rains a lot. We were waiting for our luggage and it was just so hot, but we were still really positive about everything. It was really neat to meet up with our mission president and his wife. They’re like your mom and dad. They treat you like their children and they love you like that. There are these big flowers on the trees and that’s one of my favorite things. I remember the drive to the mission home I saw a guy on a bike with a lot of coal strapped to the back. That’s how they transport things sometimes. Getting to meet my trainer was awesome. She was African and just so strong. I really did learn a lot from her. The first day was pretty neat. It was raining again and I remember climbing out the car and being instantly soaked. You’re brought to the compounds where the majority of the people live. We were dropped off at this market place where there were so many people. I remember that whole first week I had no idea where we were or where we were going. It was quite a good culture shock. Instantly you’re thrown into it.The people are very hard workers and they don’t let insignificant things bother them. They have so much faith in Jesus Christ and they have so much love for people. There are 85 languages spoke in Zambia alone. There are lots of tribes in and around Lusaka. Depending on where you serve, there is a specific language that’s more dominant. One of my areas was actually built on a mountain. You hike to and from appointments and that was pretty interesting. I think I only walked for about three months until they gave me a car. We would drive to the area and then walk around. I had a truck in one area. My last area was a little unique because the missionaries all lived in one apartment complex. That had a lot of different challenges, but it was also very good for us. Cultural wise, there isn’t a huge difference, but depending on the tribe they might have different customs. The biggest cultural shock that they face is when the husband has to pretty much buy his bride. In Zambia, the amount of money required is ridiculous. They live in poverty, but they have to spend so much money, so often they don’t. In Malawi, it’s a lot different and more relaxed. They still do it, but they’ll just say buy us two chickens or something little like that. That was probably the biggest difference between the two that I noticed.